KIEV, Ukraine -- Russia’s repeated attempts to convince the international community and its own citizens that there are no Russian troops, or weapons in Ukraine have grown tiresome and farcical, especially when compared against the meticulously researched mountain of evidence to the contrary. 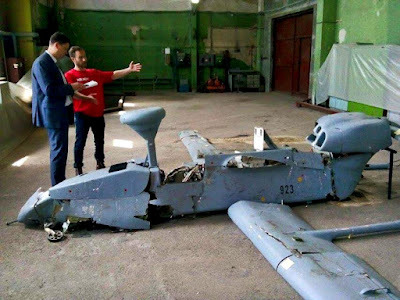 Shortly after Ukrainian troops captured two Russian Spetsnaz soldiers, a Ukrainian special forces unit of the Dnipro-1 Battalion shot down a $6 million Russian Forpost drone near Avdeevka in Eastern Ukraine. The Russian government was quick to distance itself from the soldiers, and even went so far as to parade their families in front of the media to deny their active status. However, the drone that was shot down that day is not something the Russian government can deny owning and operating. Drones, advanced as they might be, do not as of yet have the power of free will, so this particular one could not get lost and fly into Ukraine, or leave its unit to volunteer for service in Ukraine. It is one of the most advanced pieces of technology in the Russian arsenal. It’s equally capable of operating at night and in the day. It’s used to acquire a complete picture of the battlefield and relay real time information to artillery teams in order to correct their fire which devastates enemy positions. Although it doesn’t drop bombs, the impact of the surveillance is equally lethal. It takes over one year to develop the ability to operate these sophisticated machines and many more to develop the technology required to build them. They also require multi million dollar ground control stations which the separatists cannot build, operate, buy, rent, lease or sublet themselves. Most importantly, there is no other country in the world that flies the Forpost Drone but Russia. Some countries fly the Israeli Searcher drone, which the Forpost is a licensed copy of, but no other country outside the Russian Federation flies the Forpost, which was shot down on May 20th in Eastern Ukraine. This particular drone contained clearly marked ‘Forpost’ metallic plates with serial numbers inside it’s body.